Gordon Tayler, from Bunbury, Western Australia, is an accomplished composer, songwriter, instrumentalist, and music teacher. He has published many works for orchestra, voice, flute and piano. Gordon studied music at Sydney Conservatorium under Sydney Symphony flutist Peter Richardson, and in Perth with flutist Wendy Clarke. Born in Sydney, Gordon arrived in Western Australia in 1977 as a member of the Universal Brotherhood Incorporated (UBI), an alternative lifestyle community near the small town of Balingup. He was married there, raised a family, built his own house, cooked regularly for more than 60 people, assisted the installing of water, electrical and sewerage systems, and for five years was a class teacher and music specialist in UBI’s Rudolf Steiner Waldorf community school. UBI was a unique social and spiritual experiment for which Gordon provided musical direction and inspiration, writing many songs that reflected the youthful enthusiasm and the spiritually focused journey of the members. 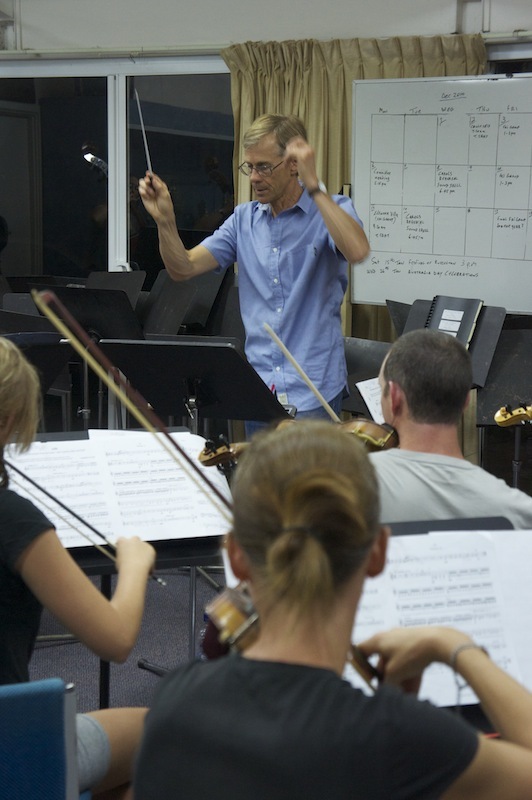 Since moving to Bunbury in 1992, Gordon has taught both privately, and as a music and instrumental specialist in State and private schools, including Bunbury Cathedral Grammar School for many years . He teaches flute, piano, guitar and music theory, and prepares students for AMEB exams. Gordon has coached and accompanied instrumental soloists, young bands and school choirs in the Bunbury Performing Arts Eisteddfod. In addition, he has co-ordinated tours for the WA Youth Orchestra, and WA Mandolin Orchestra. Gordon has been musical director, conductor and instrumentalist for many local productions, including Bizet’s ‘Carmen’, Lloyd-Webber’s ‘Jesus Christ Superstar’ and ‘Aspects of Love’, Rodgers & Hammerstein’s ‘The Sound of Music’ and ‘South Pacific’, and Sondheim’s ‘Into the Woods’. Gordon and other south-west musicians perform together in small ensembles at local functions and weddings. He has performed with South West Opera Company & Vivace as flutist in Mozart’s ‘Cosi Fan Tutte’ and Verdi’s ‘La Traviata’. My website www.gordontayler.com.au launched in 2012, assists the marketing of more than 100 of my original works, all with audio and score samples, with easy and efficient online downloading. This site is a treasury for choirs, vocal and instrumental music students and their teachers, who can find great new pieces appropriate to their skill level in many genres and categories. In 1987, the Western Australia Youth Orchestra under conductor Peter Moore, performed an orchestral work of mine during a South West tour. In 1991, my song ‘Voices in the Wilderness’ reached the finals of the National Folk Festival in Canberra. In 1994, my song ‘The Quest’ won a songwriting award in a national ‘Order of Australia’ competition. I have also composed for radio & television advertising in WA. Since 2008, my orchestration skills have matured, and are now an integral part of my work in various genres, including classical, jazz, contemporary and rock. In 2010, my orchestral work ‘Water’ reached the finals in the instrumental category of the Australian Songwriters’ Association competition. In 2011, my Orchestral Works CD ‘Earth Air Fire Water’ was premiered by the South West Philharmonic Orchestra, which I conducted, and received some airplay on ABC Classic FM radio. In 2014, my Vocal Works CD ‘Together We Rise’, was premiered with more than 30 vocalists and a 16 piece orchestra in St Boniface Cathedral, Bunbury. This compilation featured some of the best vocalists and instrumentalists in South West WA. In an ongoing project, I am collaborating with well known South-West poet and writer, Sigari Luckwell, on a 30 minute choral piece called ‘Delfini’, which uses music, song and dance to tell the story of human association with the dolphins of Koombana Bay, Bunbury. Go to these online sites to listen to audio samples from my albums, featuring some of the best vocalists and musicians in South West WA – individual tracks or full album available for purchase & download. You will not be disappointed – great gift for any occasion! Ben Mason ‘The Meaning of Work’- Bunbury Shore .. I am currently performing and presenting my piano compositions as a live healing and meditative musical experience mostly within people’s homes. Each one hour session connects the piano music with many life enhancing decrees and affirmation, while participants just rest and journey into their own meditative space.